Four sterling silver two tine hammered fruit forks with applied fish and other sea creatures. Circa 1880. 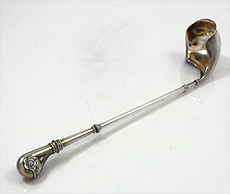 Length: 6 1/8"
Gorham Sterling Ladle 14 1/4"
An unusual Gorham ladle with hollow handle and gold washed bowl. Circa 1875. Excellent condition. The terminal has two flowers and a vine leaf at the back of the handle. Fine satin finish. Weight: 4.85 troy. The "tail" of the handle extends into the bowl. 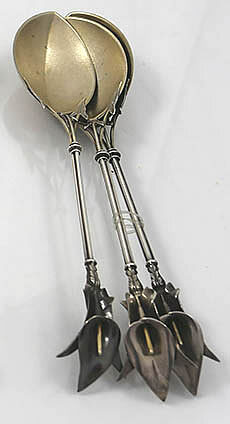 Three fine sterling silver serving spoons measuring 10 1/2". The bowls are satin finished and gold washed. The cast stamens in the cala lilies are also gold washed. Marked sterling only but known to us to be the work of Whiting, circa 1875. 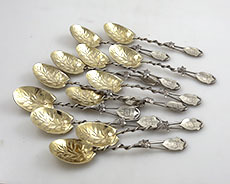 A set of 12 fruit spoons with gold washed bowls by Gorham with ornate Gothic style monograms on an applied shield at the top of the handle. The bowls are shaped in the form of a leaf and the wire handles have a ivy vine wrapped around the length of the handle terminating in an applied shield. The Gorham hallmarks, sterling and the number 44 are stamped on the back of each shield. Length: 6".